Switzerland - IOM reports that 13,924 migrants and refugees entered Europe by sea in 2017 through 22 February, with over 75 percent arriving in Italy and the rest in Greece and Spain. This compares with 105,427 through the first 53 days of 2016. That heightened activity is behind the surging number of fatalities at sea of migrants this year, especially on the Mediterranean’s central route linking Libya to Italy. IOM’s Missing Migrants Project reports an estimated 326 deaths or disappearances of migrants and refugees on this corridor through 22 February, compared with 97 last year, at this time – an increase of over 300 per cent. Across the entire region, deaths at sea stand now at 366 men, women and children, compared with 425 at this time in 2016. Another factor in these statistics: traffic between Turkey and Greece – which claimed 321 lives during the first 53 days of 2016 – has virtually ceased. 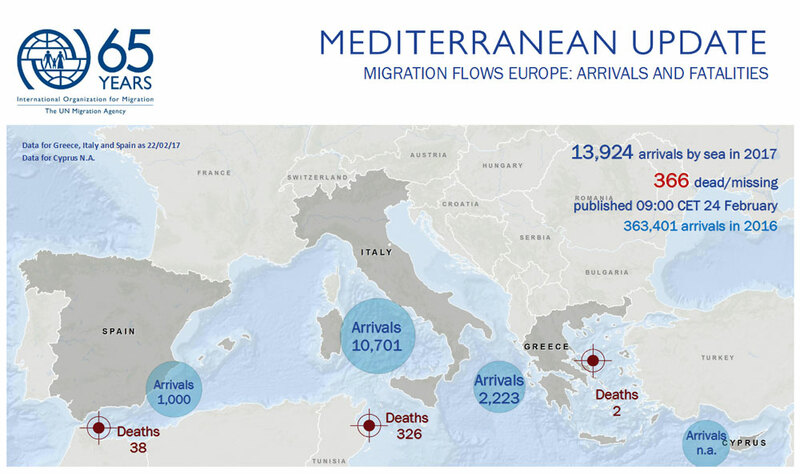 This year IOM has recorded just two deaths on the Eastern Mediterranean route.